[Q4] Under what regional and domestic political, economic, and social conditions would it be possible to reinforce a non-proliferation regime in the region including extra-regional sales? What conditions would have had to occur to make that possible? 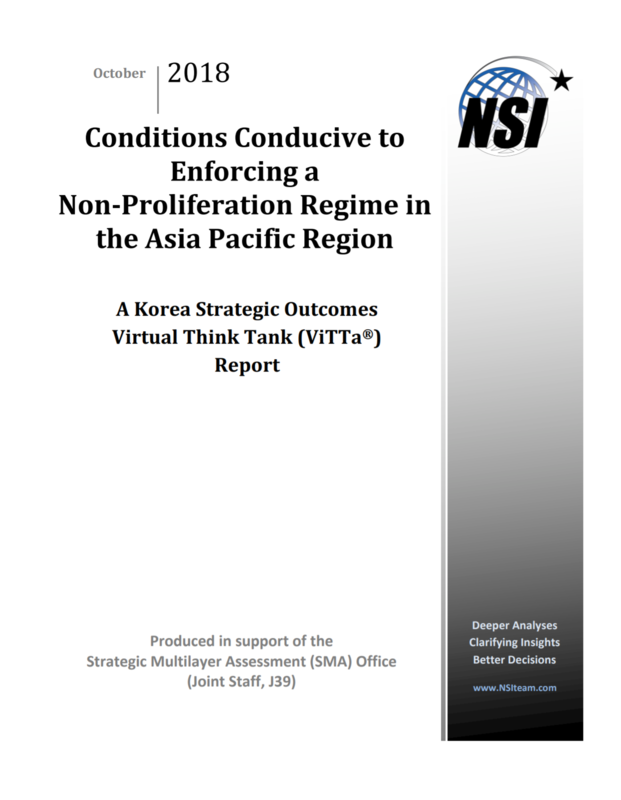 This report summarizes the input of eighteen insightful responses from the Korea Strategic Outcomes Virtual Think Tank (ViTTa) expert contributors. While this summary response presents an overview of the key expert contributor insights, the summary alone cannot fully convey the fine detail of the contributor inputs provided, each of which is worth reading in its entirety. For this report, the expert contributors consider political, economic, and social conditions that are conducive to enforcing a non-proliferation regime in the Asia Pacific region. This summary first highlights the conditions most frequently cited as being conducive to regional non-proliferation, and then details several non-proliferation regimes and the contributors’ assessments of whether such regimes could be enforced in the Asia Pacific region. Two key conditions emerge from the expert contributor response as particularly conducive to nonproliferation in the Asia Pacific region: the presence of a multilateral regional security dialogue, and providing the DPRK with political, economic, and security assurances and guarantees. The condition most frequently cited as being conducive to regional non-proliferation in the Asia Pacific is the establishment of a multilateral regional security dialogue and framework that encompasses both key regional actors and international organizations. Such an Asia Pacific regional security architecture would have to consider important regional non-proliferation issues, including the region’s principal proliferation concerns regarding the DPRK’s acquisition and export of nuclear technology, materials, and expertise, as well as other regional concerns relating to illicit nuclear proliferation activities.1 Approaching these key regional non-proliferation matters within a formal multilateral regional security dialogue and framework, contributors suggest, is a fundamental prerequisite for any real progression toward developing a regional non-proliferation regime.2 Ultimately, as Dr. Andrew O’Neil of Griffith University explains, an Asia Pacific regional non-proliferation regime is more likely to materialize as a corollary of a formal multilateral regional security architecture than as something that emerges spontaneously. guarantees, as well as in the types of assurances and guarantees they suggest. Some contributors advocate for economic assurances and guarantees above all else. Ken Gause of CNA and Dr. Gregory Kulacki of the Union of Concerned Scientists, for example, believe that the best way to reinforce regional non-proliferation with the DPRK is through enhanced economic measures, rather than enhanced security measures. Gause contends that if the DPRK is properly compensated in terms of economic and security guarantees, there will be no real reason for the regime to proliferate (i.e., the regime would not want to risk being caught, nor would it want to risk having to further sacrifice elements of its nuclear program as punishment). Kulacki maintains that creating and advancing a clear pathway for economic development in the DPRK is the condition most conducive to regional non-proliferation, as DPRK proliferation activities, he argues, are driven by economic needs, not political ambitions. Ultimately, Gause and Kulacki agree that regional actors may be able to extract compromises or concessions from the DPRK on regional non-proliferation reinforcement and verification initiatives in exchange for economic assistance. Anthony Rinna of Sino-NK highlights targeted bilateral and multilateral cooperation, particularly as a means of shifting current DPRK capabilities away from military use and toward peaceful civilian use, as a condition that is both conducive to regional non-proliferation and fundamental to enforcing any eventual regional non-proliferation regime. Contributors also reflect on more specific non-proliferation regimes, considering both existing and potential non-proliferation regimes and whether such regimes could be enforced in the Asia Pacific region. Several contributors reflect on the Treaty on the Non-Proliferation of Nuclear Weapons (NPT) and whether it could be reinforced in the Asia Pacific region. The NPT is an international treaty, with 191 state signatories, that aims to prevent the spread of nuclear weapons and weapons technology, promote cooperation in the peaceful use of nuclear energy, and further the goal of achieving nuclear disarmament. The treaty forbids the transfer of nuclear weapons by nuclear-weapon states (Article I) and the receipt or possession of nuclear weapons by non-nuclear-weapon states (Article II).8 With such a foundational international non-proliferation regime already in place, it is reasonable to wonder why it has not been enforced in the case of the DPRK. One issue with attempting to enforce the NPT with the DPRK, and in the Asia Pacific region more broadly, contributors explain, is that while all other countries in the region are parties to the NPT, the DPRK is not.9 Consequently, as Vestergaard argues, there ultimately cannot be a strong non-proliferation regime in the Asia Pacific region as long as the DPRK remains outside of the NPT and the international system of nuclear safeguards. The most straightforward condition for enforcing a non-proliferation regime in the region, therefore, may be convincing the DPRK to rejoin the NPT. Knopf reminds us, however, that the role of international organizations in verifying and, therefore, reinforcing non-proliferation commitments cannot be discounted. If the DPRK were to commit to rejoining the NPT, it would also have to commit to allowing the International Atomic Energy Agency (IAEA) to monitor and verify compliance, and ultimately enable it to function as a confidence-building mechanism between the key parties. Dr. James Platte of the United States Air Force Center for Strategic Deterrence Studies believes that this may be the ideal outcome in terms of enforcing a non-proliferation regime in the region. He cautions, however, that because the DPRK has failed several times in the past to live up to commitments to not develop nuclear weapons, there may be significant skepticism regarding any future DPRK commitment to rejoin or adhere to the NPT. Therefore, as O’Neil suggests, the utility of an international non-proliferation regime such as the NPT may be limited in the case of the DPRK and the Asia Pacific region. Contributors generally agree, however, that the NPT regime does offer a useful legal and political framework and point of reference for any efforts to develop of a new regional non-proliferation regime tailored to the Asia Pacific. Contributors also reflect on potential alternative options for developing enforceable regional nonproliferation regimes in the Asia Pacific. 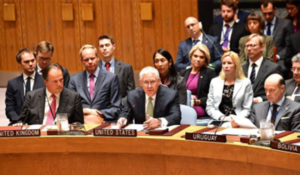 Ankit Panda of The Diplomat and Yun Sun of the Stimson Center highlight what may be fundamental conditions for achieving any enforceable non-proliferation regime in the region. According to Sun, the international community would have to embrace the DPRK as a normalized member of the international community and, at the same time, the DPRK would have to embrace full IAEA safeguards. Panda echoes this assessment, expounding that, once such progress is made (i.e., the US determines that it will have to live with a nuclear-armed DPRK in the short-term), the US should endeavor to incorporate the DPRK into contemporary non-proliferation regimes. He warns that doing so may be challenging, however, as the DPRK is inherently skeptical of invasive arms control regimes. potential foreign customers).13 Reinforcement of such a non-proliferation regime, he contends, will first require strong enforcement of supply-side measures (i.e., sanctions), which he acknowledges are imperfect, and will then require strong enforcement of demand-side measures, which if not appropriately addressed, he explains, may enable the DPRK to exploit the imperfections in the supply-side measures. Other contributors focus on conditions conducive to reinforcing potential regional non-proliferation regimes in the Asia Pacific. Dr. Gary Samore of Harvard University believes that reinforcing any DPRK commitment to non-proliferation requires, above all else, strong enforcement capabilities (e.g., strong intelligence capabilities to detect export attempts and regional cooperation to interdict such attempts). Dr. Michael Swaine of the Carnegie Endowment for International Peace offers a similar assessment, arguing that any significant reinforcement will require an expanded, more binding, and more enforceable version of the Proliferation Security Initiative to include both China and India, as well as improved intelligence, investigation, and detection agreements among key regional actors. He warns, however, that achieving such conditions may require additional funding from the UN and/or participant nations, a more formal oversight structure, and greater transparency. Robert Shaw of the Middlebury Institute for International Studies and Kelly Wadsworth of the University of Pittsburgh argue that establishing strong export control measures is essential to reinforcing regional non-proliferation. Finally, however, Brig Gen Robert Spalding of the United States Air Force offers an alternative perspective and a word of caution, warning that China may play spoiler to any US efforts to reinforce regional non-proliferation. China does not view proliferation as a threat, he contends, but rather as an opportunity to further weaken the US and, therefore, should be expected to enable nuclear proliferation as a means of creating continuing challenges for the US to solve.